For any B2B relationship, file transfers should be as smooth as spreading melted butter on toast. With auto-receive we’re one step closer towards achieving that goal. Recipients can now automatically receive any file that senders deliver. No more clicking “Accept” and “Download.” They just show up on the subscribed computer as soon as the transfer is complete. As a sender, power through file transfers to multiple recipients: If you’re regularly sending the same files to multiple people, channels allow you to establish the fastest connection possible between you and clients. When you finish sending a file to a channel, subscribers begin downloading the file without the click of a button. As soon as the file is delivered, you’ll be notified via email. The initial setup takes about 5 minutes for both parties. As a recipient, automate your incoming file transfer workflow: Instead of babysitting file transfers, channels allows your team to spend more time working on things that actually matter. As soon as the file is ready for you, an email notification will be delivered. Group members can subscribe to a channel so that their devices (a computer or mapped network drive) automatically download any files that are sent to that channel. There is no limit to the number of channels or subscribers to a channel within a group. 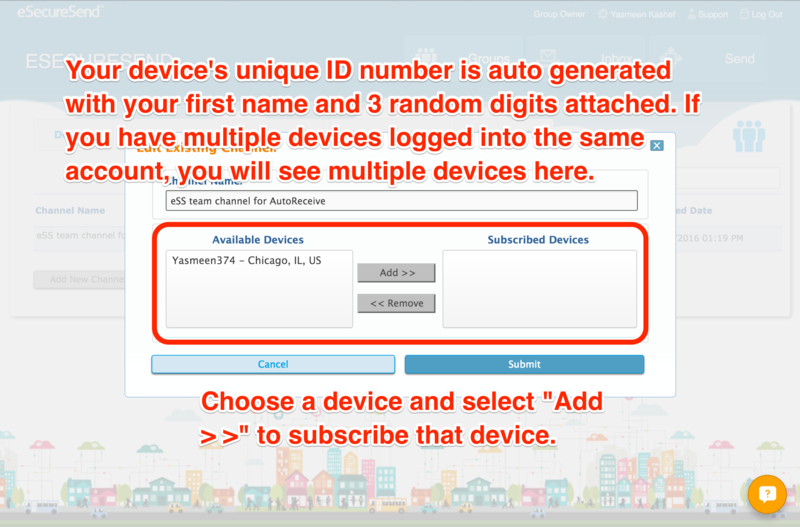 Ask desired group members to subscribe their devices. Group members subscribe their devices and set up their default download locations. 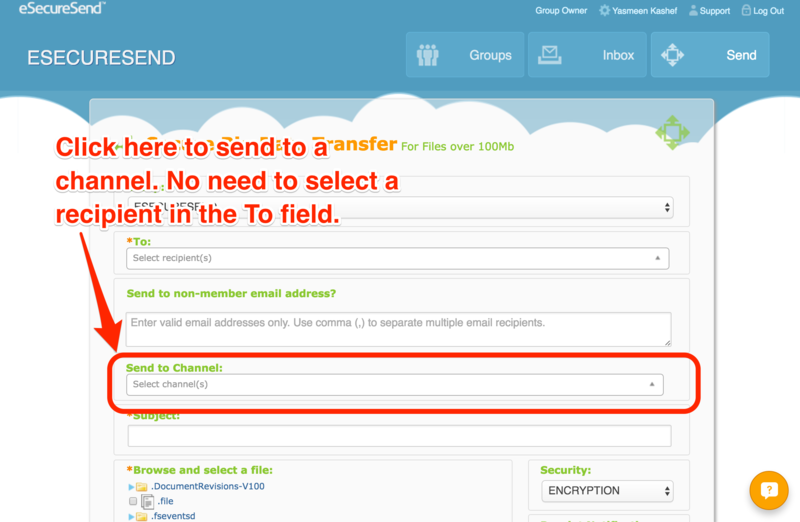 Sender sends a file to the channel by selecting channel instead of “To” recipients. File shows up on subscriber’s device. Email notification is sent to both sender and recipients. 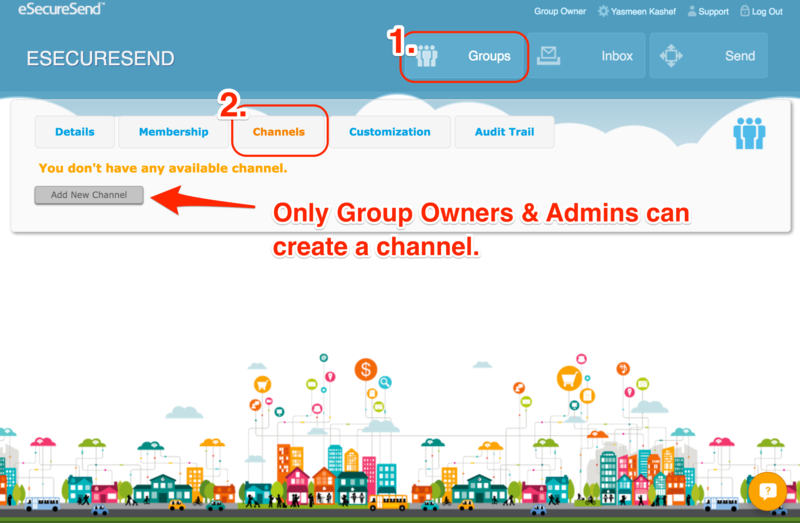 To create a channel, navigate to Groups page. Channel Details will have an option to create a unique name and to subscribe a device. Desktop agent needs to be activated and online to subscribe to a channel. To access Channel Details, hover over the name. 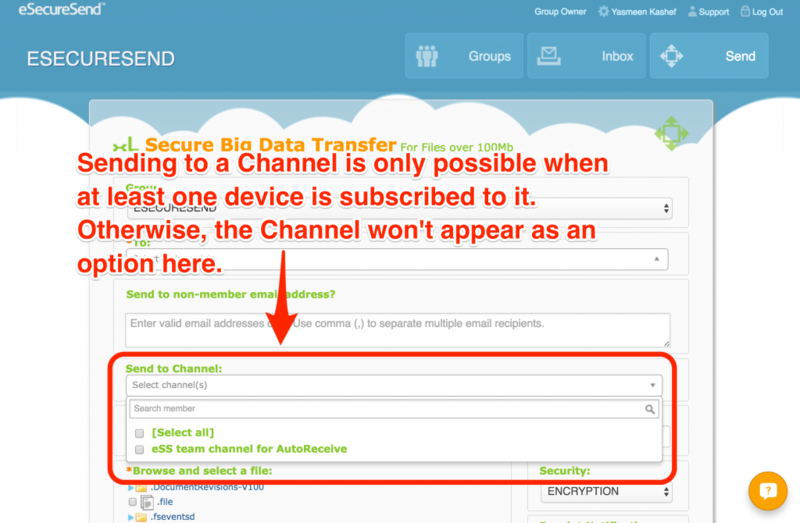 Once a channel is created, anyone in the group can subscribe to automatically receive files that are sent to that channel. As a group owner or admin, you’ll be able see who is subscribed and have the ability to cancel their subscriptions. As of right now, you’ll have to contact group members outside of eSecureSend and request that they log into the website and subscribe to the channel. We’re working towards creating one-click button for notifying group members. To set up default download locations, follow the step-by-step guide by clicking here. Once you’re all set it up, communicate with group members so that everyone knows that they can start sending to your devices. Anyone within the group can send a file to the channel. 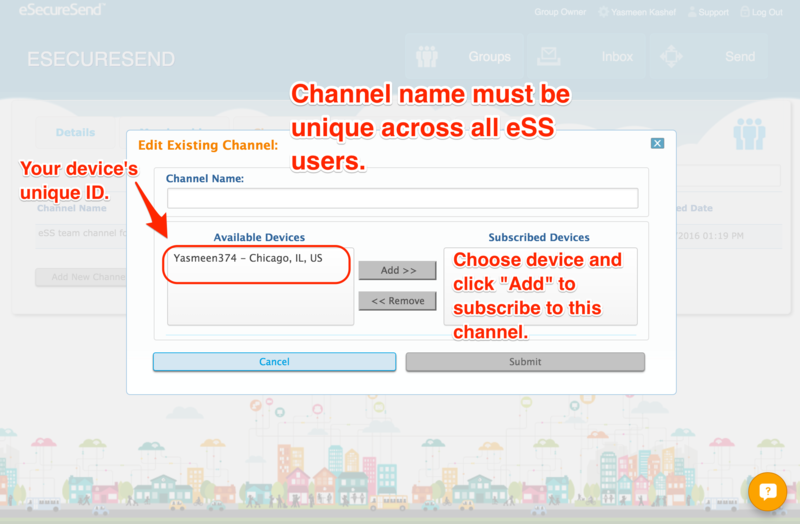 Sending to a channel is available when there is a device subscribed to the channel. Sit back and relax because the file will automatically show up on subscribed devices. 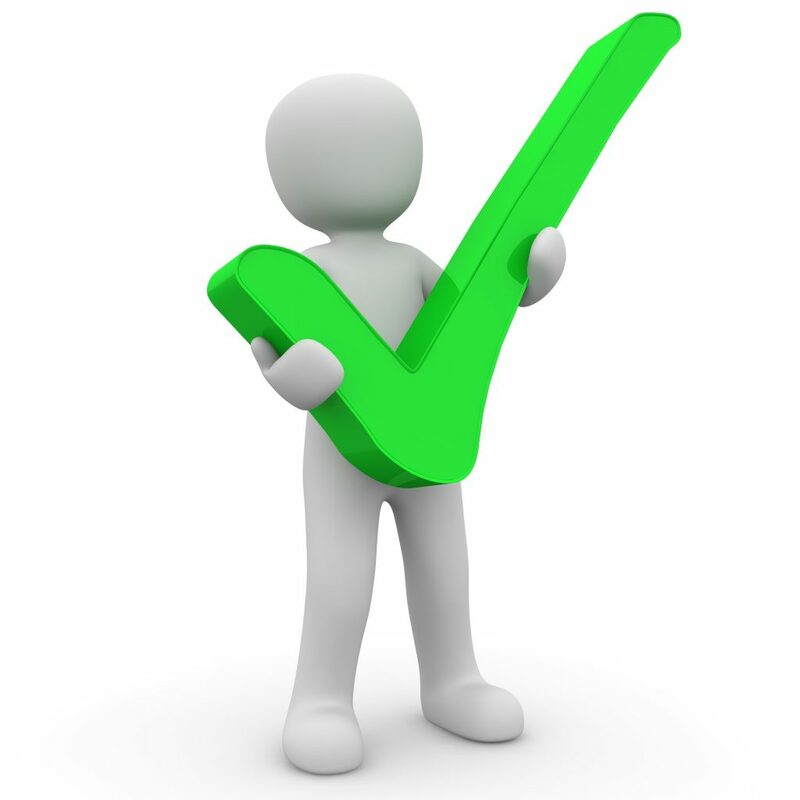 Once the transfer is complete, both senders and recipients will be notified that the file transfer was a success. Group Owners and Admins only. Who can subscribe to a channel within a group? Who can see who is subscribed to a channel? Group Owners and Admins. They can also unsubscribe members’ devices from a channel. Can you check the progress of any file that is being automatically received? Yes, they’re located in the status notification where manual transfer statuses appear. 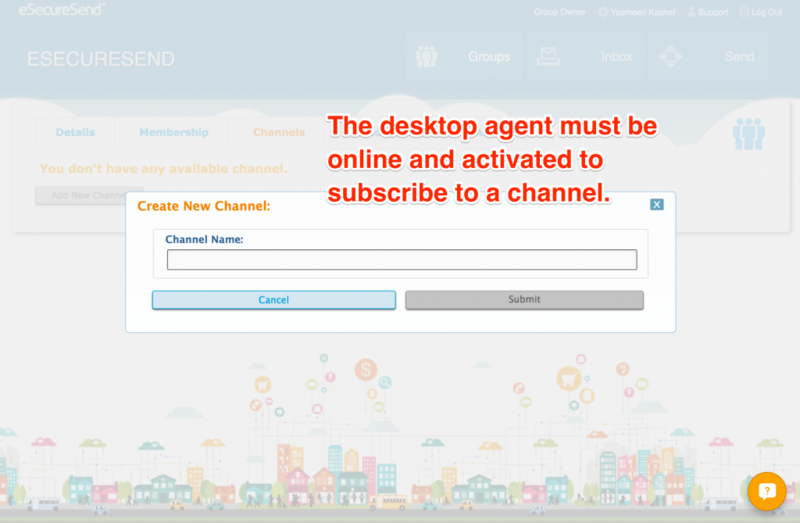 If the desktop agent is offline, will it still auto-receive? Within a 10-day window, yes. The agent will know that it has a file waiting to be auto-received. As soon as it’s back up and running, it will still auto-recieve. This does not affect sending of a transfer.